Did you just bring home a kitty? First, take a moment of silence to honor the pristine furniture that once was. Now, face reality: cats have a biological need to sink their claws into things. Upholstered furniture, rugs, bedding, pillows, curtains, and human casualties stand no chance. You can be like grandma, circa 1972 and cover your stuff with vinyl. 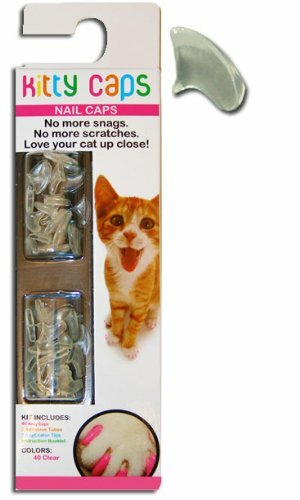 Or, you can cover your cat's claws with "Kitty Caps." They are a set of vinyl-resin caps that glue onto each of your cat's claws. Schedule in a "pedicure" and have a professional put them on; you'll be stress-free for at least a couple months. Approximate total cost: $30.00. Well worth it. This is not a scratching post. These are my Sushi's claws with the caps attached. No sharp points and furniture safe!